The first step is prevention, and regular maintenance of your rig can help you avoid breakdowns all together. But you’ll also want to plan ahead and know when the next truck stop is coming up. That way if you do start to have problems, you can make a judgment call as to whether you can hold out to get your truck to a rest stop and avoid being stranded on the shoulder. Breaking down in a semi truck can be especially scary if you lose control, so it’s important to remain calm and take the right steps to keep yourself and other drivers safe. If you can, it’s better to get off of the highway where there is less traffic than pull over on the shoulder. Always stay in your vehicle if you broke down in a dubious looking neighborhood. But if you’re in an area with several other drivers, then you should put on your hazard lights and use flares or reflectors to keep other cars from hitting you. 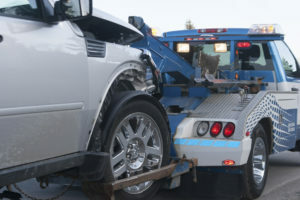 Once you’re safely pulled over, you should call your dispatcher or call for a tow truck if you’re an independent contractor. Otherwise, if you feel safe to get out, then you can pop the hood to signal that you’re broken down and to evaluate your situation. There are several tools that you should keep on hand so that you can be ready to make some emergency repairs to hold you until the mechanic. Things such as spare fuses, tires, oil, coolant, and even duct tape are all what you should add to a standard toolkit. You should always pack another change of clothes and food in case you have to stay somewhere overnight. Whether you are looking to upgrade your fleet to tow trucks or simply interested in the latest trucking technology, you can rely on Baltimore Freightliner-Western Star. We have provided top-notch service for the trucking industry for 30 years and would love to assist you in buying a new top-of-the-line truck, finding the specialty parts you need, or repairing your truck. Give us a call toll-free at 800-832-7278 or locally at 410-685-4474, or contact us online. To find out more about what we are up to, follow us on Facebook, Twitter,and Pinterest. This entry was posted on Monday, April 8th, 2019	at 6:40 pm	and is filed under Trucking Lifestyle	. You can follow any responses to this entry through the RSS 2.0	feed. Both comments and pings are currently closed.